In the past two weeks the 106 6th grade students from Secondary School “Ioan Vlăduţiu” Luduş, Mureş County, Romania, have learned about the differences between parallel and serial circuits design and functions with the “Electrical Circuit Lab” from Go-Lab / Next-Lab platform. Organised in teams, they performed inquiry tasks such as identifying variables, making predictions, conducting experiments and drawing evidence-based conclusions. The students have created a final report of their work using the Report Tool, in which they included the content of other tools, such as concept maps, hypotheses, and observations. All the reports have been saved in .pdf format and uploaded to the Inquiry Learning Space. The lessons have been integrated into the school curriculum. A group of 8th grade students from Secondary School “Ioan Vladutiu”, Luduş, Mureş County, Romania visited SAMARCU S.R.L on 13th April, 2018. The main objective behind the visit was to make the students aware about the various activities related to production, assembling and packaging. After an introductory presentation, the students were headed by Mihai Man, administrator of the company, who helped them to understand how production is carried out in company and how company reach their customers. Mr. Man provided information about the company’s history, explaining the process by which the products are made and sold, showing products, demonstrating the use of technical devices and machinery etc. 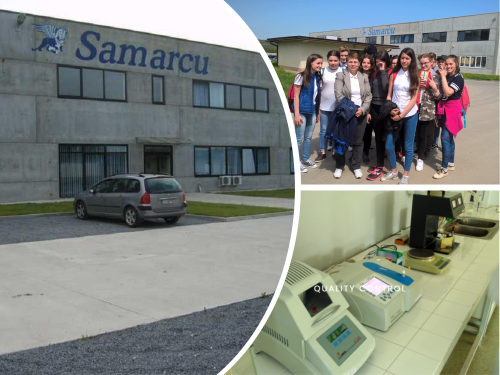 Samarcu SRL, a Romanian company with Italian capital, was founded in 2002 and later becoming a member of the Otlav – Italia Group, its majority shareholder. The company is specialized in electrolytic galvanization with swivel-drums, in powder coating, and assembly operations plus packaging. The modern factory consists in various production departments, equipped with production lines and machinery of last generation. The quality is guaranteed by professionals able to do the physical-chemical analysis of all solution existing in the electrolysis tubs, pre-treatment in a passive state, the PH and temperature control, as well as the quantity of deposited substance. The controls and tests are made daily on each batch produced. Samarcu achieved in 2004 the integrated Environment Authorization nr. SB 02, in 2005, the Integrated Environmental Authorization (I.P.P.C.) the second of the region, renewed in 2011. Samarcu represents one of the companies that sustain the development of Ludus town, offering jobs for its inhabitants and support for the schools. In October 2017, Samarcu S.R.L. sponsored our school with two advanced SMART Board systems. After the visit, the students were organised in teams. Every team will make a project about these professions (the educational path, the necessary skills, responsibilities and activities, science etc.). The projects will be presented in front of all their colleagues from the 8th grade. Lorena Elena Olaru, Physics, Chemistry and ICT teacher, Scientix ambassador for Romania. The students from our school celebrate careers and studies in the fields of Science, Technology, Engineering and Mathematics (STEM) by participating in two activities: “Do You Have a Dream Career?” and “Little scientists study series and parallel circuits”. The 8th grade students will visit companies from our city (such as SAMARCU SRL, Drinking Water Plant etc.) where they will learn about different STEM professions. After that, the students will be organised in teams. Every team will make a project about these professions (the educational path, the necessary skills, responsibilities and activities, science involved etc.). The projects will be presented to the students from 7th and 8th grades and will be published on a blog dedicated to STEM Discovery Week. – How can a circuit with more than one light bulb be created that will allow one light to stay lit when the others are removed? I will implement “Light bulbs in series and parallel” in an ILS (Inquiry Learning Space) wich will be integrated into the school curriculum. My name is Lorena Elena Olaru. I am teaching Physics, Chemistry and ICT in lower Secondary School “Ioan Vlăduţiu” Luduş, Mures County, Romania.